May the light of wisdom shine forth. And enter into the practices of a bodhisattva. The objective domain of self-aware wisdom. followed by the usual verses of salutation to the Buddha, before addressing the congregation. 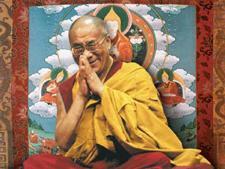 “When the Buddha appeared in the world 2600 years ago, he was skilful, compassionate, highly intelligent and wise. After him came a series of celebrated Indian masters, Nagarjuna and his followers, as well as Asanga and his, among whom were the great logicians Dignaga and Dharmakirti. 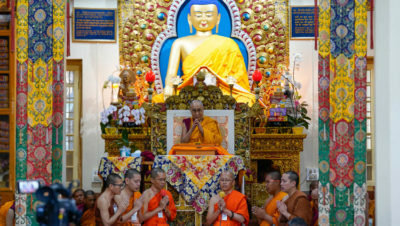 They maintained the Buddha’s teachings by listening to them, reflecting on them and meditating on what they’d understood. This is how they were passed down from generation to generation. “From India the Buddha’s teachings spread as the Pali Tradition to Sri Lanka, Thailand, Burma and so forth, and as the Sanskrit Tradition to China, Korea, Japan and Vietnam, as well as Tibet. Nagarjuna is well known among followers of the Sanskrit tradition. Reading his writings and those of his disciples we can appreciate how great they were. “In the first turning of the wheel of dharma, the Buddha explained the Four Noble Truths and their 16 characteristics. For those who wished to understand them better, particularly true cessation and the true path, he gave the Perfection of Wisdom teachings on Vulture’s Peak, outside Rajgriha. “The verse you chanted after the ‘Heart Sutra’ is about developing wisdom. The line about overcoming obstacles indicates that you need to know what ignorance is and what factors oppose it. The final line about engaging in the practices of bodhisattvas implies that for wisdom to be effective, you need a kind heart. Is said to be empty. He clarified that references to emptiness do not mean nothingness, rather that things lack independent existence. They don’t exist in and of themselves. Things are not solid and substantial the way they appear to be, they exist in dependence on other factors. Emptiness means dependently arisen; lacking independent existence. His Holiness mentioned the main forms of reasoning used to establish selflessness—diamond slivers, refutation of the four extreme types of production and the reasoning establishing the lack of being one or many. However, dependent arising is regarded as the king of reasonings because it looks at emptiness from the point of view of cause, nature and result. His Holiness observed that chapter 26 of ‘Fundamental Wisdom’ deals with the twelve links of dependent arising beginning with ignorance, because of which we are in the cycle of existence, and going on to karma, name & form, and concluding with aging and death. To reverse or overcome this process we must overcome ignorance. He added that chapter 18 deals with selflessness, while in chapter 24 Nagarjuna addresses the objections of Buddhist Realists, who assert that if things lack inherent existence, nothing would exist. He replies that they have not understood the meaning and purpose of emptiness. The Perfection of Wisdom teachings state that things have merely nominal existence; they exist in terms of names and labels. His Holiness quoted a verse from Aryadeva’s ‘400 Verses’ that asserts that ignorance, which refers to our misconception of reality, permeates our mental afflictions. Confusion is present in all [mental afflictions]. Overcoming this ignorance requires making an effort to understand dependent arising. His Holiness compared our exaggerated view of reality with what American psychiatrist Aaron Beck told him he had observed in people afflicted by anger. They tend to see the person or situation they are angry with in a wholly negative light, but this view is 90% mental projection. During a brief question and answer period His Holiness spoke of the value of trying to cultivate the awakening mind of bodhichitta even if you live a busy life. He pointed out that the practice of emptiness focuses on enlightenment, whereas the practice of bodhichitta focuses of sentient beings. He explained the value of maintaining the practice of the Six Session Yoga in relation to purifying broken commitments. He commended the Taiwanese students’ aspiration to study the classic Buddhist texts and advised them to read them in their own language—Chinese. Taking up Chandrakirti’s ‘Entering into the Middle Way’ (Madhyamakavatara) His Holiness announced his intention to give a complete reading transmission of the text within the time available. He added that although he had reached chapter six last year, because of the presence of a young Bhutanese Lama, Jangtrul Rinpoche, who has not heard this text before, he intended to start again from the beginning. He mentioned that he received the explanatory transmission of this book from Ling Rinpoche. Starting with the title in Sanskrit and Tibetan, His Holiness read steadily through the verses stopping here and there to offer clarifying remarks. Before ending the session he recommended examining and analysing well the philosophical positions described in the text. He suggested that taking a wider perspective on different points of view yields a broader and firmer understanding. Aversion for another’s view: all this is thought. Through reason and analysis, we will be swiftly freed. After leaving the temple and walking the corridor alongside it relatively briskly, His Holiness paused at the bottom of the temple stairs to respond to the members of the public reaching out to him. He shook hands, patted heads, exchanged a few words here and there, as well as blessing rosaries proffered to him, before climbing into a car that would drive him home. The teachings will continue tomorrow.